Our wine is available throughout the bay area including the Calistoga Wine Stop, Solbar and Sam's Social Club in Calistoga as well as the Peninsula Hotel in Beverly Hills. Check out our new Jack Brooks Vineyard hats. They are really cool and we know that you will enjoy wearing it. Both Larry and Eileen were born and raised in Chicago. They started visiting the wine country in the early 1990’s and fell in love with the combination of rural living while still having access to many of the activities and interests that they enjoyed in Chicago. After spending countless vacations in Napa and Sonoma, they both realized that they would love to live in this part of the country and began looking for property to purchase. In 1999, they found their perfect slice of paradise just north of Calistoga within walking distance of Chateau Montelena and in 2000, they were fortunate enough to have a small Cabernet Sauvignon vineyard planted. The vineyard and the wine were named after Larry and Eileen’s fathers: Jack Arnoff and “Brooks” Ghilarducci. Neither of them was ever in Napa, but they did inspire both Larry and Eileen to follow their dreams and Jack Brooks Vineyard is their dream. Prior to running Jack Brooks Vineyard, Larry worked as a business consultant and has helped a number of wineries in both Napa and Sonoma improve their performance and streamline operations. Eileen also has significant winery experience. She has been the controller for a number of wineries in the wine country. 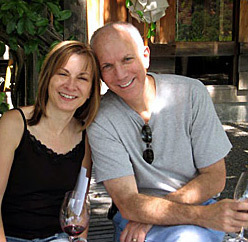 Eileen and Larry have both learned the wine business from significantly different perspectives. However, through their varied experiences, they realized that they could make outstanding cabernet from their vineyard by controlling both the vineyard maintenance and winemaking process resulting in a truly hand crafted wine. Larry and Eileen’s vision for Jack Brooks Vineyard is to remain a small boutique wine producer and sell their wines to people who will enjoy drinking it as much as they do. © 2019 Jack Brooks Vineyards. All rights reserved. By clicking "ENTER" you verify that you are 21 years of age or older.